“In life, you gotta take the crooked with the straight.” That’s what the main character, Troy Maxson, believes in August Wilson’s Pulitzer Prize winning drama “Fences”. 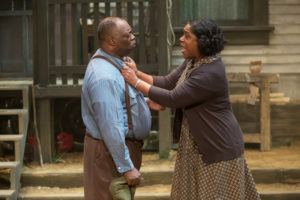 Director Christopher V. Edward’s powerful rendition of this iconic stage play at the Cincinnati Shakespeare Company captures hearts and minds, bringing to life the promise, pain, joy and heartbreak of being black in America during the late 1950’s. Set in Wilson’s hometown of Pittsburgh, Pa., “Fences” shows the physical and emotional struggle of trying to achieve the ideal American Dream against racial barriers. The realities of black poverty are present more than ever in the set, designed by Shannon Moore, featuring a barren yard with more cracked dirt than grass, a lonely baseball tied to a tree and a porch for conversations both joyous and tough. CSC newcomer “ranney” leaves everything on the stage as Troy, a broken black garbage collector whose dreams of making it to the big league disappear at the all-too-familiar hands of racism. Professional Baseball was not open to him at the time, no matter what his swing. Bitter by his circumstances, Troy turns to the bottle, arrogance and telling crazy stories to survive. Joined by him are his beautiful lady love Rose (Torie Wiggins), dedicated to fulfilling her wifely duties, often times at the expense of her own hopes and dreams; Gabriel (Geoffrey Warren Barnes II), a younger brother disabled from war injuries; Cory (Crystian Wiltshire), a son with dreams of being a successful football player; and Lyons (Darnell Pierre Benjamin), a middle-aged son whose creative spirit often leaves him begging for money to stay afloat. “Fences” is a must-see for those who wish to know how racism can hinder and impact African American families for generations. As Troy’s good friend Bono (Sylvester Little, Jr.) notes, “some people build fences to keep people out, other people build fences to keep people in.” Society has built fences in numerous ways to keep African Americans from succeeding and equaling the playing field among races. Yet, Troy, through his determination, keeps swinging for the fences, despite a few misses. August Wilson’s “Fences” is a part of the Cincinnati Shakespeare Theatre Company’s 25th Anniversary season and will run until Feb. 16, 2019. Tickets can be purchased online, by calling the Box Office at (513) 381-2273 ext. 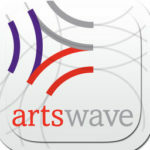 1 or in person seven days a week noon – 5pm at The Otto M. Buddig Theater 1195 Elm Street Cincinnati, OH 45202. This was written by Sheldon Polonsky. Posted on Monday, January 28, 2019, at 3:38 pm. Filed under Stage Insights News, Stage Insights Reviews. Bookmark the permalink. Follow comments here with the RSS feed. Comments are closed, but you can leave a trackback.